Processes underlying the temporal and spatial variations observed in the distribution of jellyfish and non-gelatinous zooplankton in the Gulf of Oman are not well understood. This information gap is clearly a major issue in controlling the harmful blooms of jellyfish and non-gelatinous zooplankton. Samples of jellyfish and non-gelatinous zooplankton were collected from six stations in Chabahar Bay and three stations in Pozm Bay within four seasons. At each station, environmental variables were also recorded from bottom and surface water. A total of 83 individuals of medusae representing four species of Scyphozoa (i.e., Cyanea nozakii, Chrysaora sp., Pelagia noctiluca, Catostylus tagi) and species of Hydrozoa (i.e., Diphyes sp., Rhacostoma sp., Aequorea spp.) were observed in the study area. A total of 70,727.25 individuals/m−3 of non-gelatinous zooplankton dominated by copepods and cladocerans were collected in nine stations within the four seasons. The results of a RELATE analysis yielded no significant association between species composition for jellyfish and non-gelatinous zooplankton. Among environmental variables, water transparency, nitrite concentration, water depth and temperature were better associated with the total variation in jellyfish species composition than with that of non-gelatinous zooplankton. Dissolved oxygen, pH, and phosphate concentration were significant environmental variables associated with the variation in the spatial and temporal distribution patterns of non-gelatinous zooplankton assemblages. Although some jellyfish species (i.e., Rhacostoma sp., Pelagia noctiluca, Catostylus tagi) occur independently of non-gelatinous zooplankton assemblages, other jellyfish (i.e., Chrysaora sp., Aequorea spp., Cyanea nozakii, Diphyes sp.) are strongly correlated with non-gelatinous zooplankton assemblages. 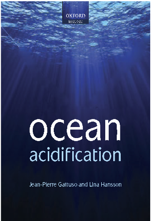 Ocean acidification is expected to intensify due to increasing levels in the partial pressure of atmospheric CO2 (pCO2). This could negatively affect major calcifying reef organisms. In this study, the effects of different levels of CO2-driven acidification of seawater (control: pH 8.1; moderate: pH 7.8; intermediate: pH 7.5; and severe: pH 7.2) on the net calcification rate and activity of enzymes related to the calcification process (Ca-ATPase and carbonic anhydrase) were evaluated in the calcareous hydrozoan Millepora alcicornis. The experiment was run for 30 d using a marine mesocosm system. Net calcification ratio was significantly reduced in hydrocorals exposed to intermediate seawater acidification for 16 d and to severe seawater acidification for 16 d or 30 d, compared to animals at control conditions. However, only hydrocorals exposed to severe seawater acidification showed lower net calcification rates than those exposed to control conditions for 30 d. In accordance, the activities of enzymes involved in the calcification process markedly increased in hydrocorals exposed to reduced pH. Ca-ATPase seemed to be more sensitive to seawater acidification than carbonic anhydrase as it increased in hydrocorals exposed to intermediate and severe seawater acidification for 30 d, while carbonic anhydrase activity was only stimulated under severe seawater acidification. Therefore, our findings clearly show that the hydrocoral M. alcicornis is able to cope, to some extent, with long-term CO2-driven acidification of seawater (pH ≥ 7.5). In addition, they show that Ca-ATPase plays a key role in the maintenance of calcification rate under scenarios of moderate and intermediate levels of seawater acidification. However, the observed increase in Ca-ATPase and carbonic anhydrase activity was not enough to compensate for the effects of CO2-driven reduction in seawater pH on the net calcification rate of the hydrocoral M. alcicornis under a scenario of severe ocean acidification (pH 7.2). Eutrophication-induced hypoxia is one of the primary anthropogenic threats to coastal ecosystems. Under hypoxic conditions, a deficit of O2 and a surplus of CO2 will concurrently decrease pH, yet studies of hypoxia have seldom considered the potential interactions with elevated pCO2 (reduced pH). Previous studies on gelatinous organisms concluded that they are fairly robust to low oxygen and reduced pH conditions individually, yet the combination of stressors has only been examined for ephyrae. The goals of this study were to determine the individual and interactive effects of hypoxia and elevated pCO2 on the asexual reproduction and aerobic respiration rates of polyps of the scyphozoan Aurelia aurita during a manipulative experiment that ran for 36 d. pCO2 and pO2 were varied on a diel basis to closely mimic the diel conditions observed in the field. Exposure to low dissolved oxygen (DO) reduced asexual budding of polyps by ~50% relative to control conditions. Under hypoxic conditions, rates of respiration were elevated during an initial acclimation period (until Day 8), but respiration rates did not differ between DO levels under prolonged exposure. There was no significant effect of increased pCO2 on either asexual reproduction or aerobic respiration, suggesting that elevated pCO2 (reduced pH) did not exacerbate the negative reproductive effects of hypoxia on A. aurita polyps. The giant green sea anemone (Anthopleura xanthogrammica) inhabits the rocky intertidal zone in California and Oregon. Two photosynthetic algal symbionts, zooxanthellae and zoochlorellae, make these anemones important primary producers in the intertidal zone. This study investigated the effects of changes in temperature and pH on anemones and their symbionts over a natural environmental gradient along the coast of California and Oregon. Zoochlorellae responded negatively to warmer temperatures and positively to more acidic conditions, while zooxanthellae responded positively to warmer temperatures and lower pH. Temperature and pH did not significantly affect chlorophyll a concentrations or anemone protein biomass. Depending on the magnitude of future changes in ocean temperatures and acidity, changes in the ranges of the two types of symbionts and increased densities of sea anemones in the rocky intertidal could be expected to occur. The composition of local ecological communities is determined by the members of the regional community that are able to survive the abiotic and biotic conditions of a local ecosystem. 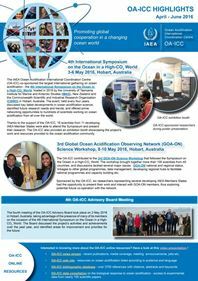 Anthropogenic activities since the industrial revolution have increased atmospheric CO2 concentrations, which have in turn decreased ocean pH and altered carbonate ion concentrations: so called ocean acidification (OA). Single-species experiments have shown how OA can dramatically affect zooplankton development, physiology and skeletal mineralization status, potentially reducing their defensive function and altering their predatory and antipredatory behaviors. This means that increased OA may indirectly alter the biotic conditions by modifying trophic interactions. We investigated how OA affects the impact of a cubozoan predator on their zooplankton prey, predominantly Copepoda, Pleocyemata, Dendrobranchiata, and Amphipoda. Experimental conditions were set at either current (pCO2 370 μatm) or end-of-the-century OA (pCO2 1,100 μatm) scenarios, crossed in an orthogonal experimental design with the presence/absence of the cubozoan predator Carybdea rastoni. The combined effects of exposure to OA and predation by C. rastoni caused greater shifts in community structure, and greater reductions in the abundance of key taxa than would be predicted from combining the effect of each stressor in isolation. Specifically, we show that in the combined presence of OA and a cubozoan predator, populations of the most abundant member of the zooplankton community (calanoid copepods) were reduced 27% more than it would be predicted based on the effects of these stressors in isolation, suggesting that OA increases the susceptibility of plankton to predation. Our results indicate that the ecological consequences of OA may be greater than predicted from single-species experiments, and highlight the need to understand future marine global change from a community perspective. Anthropogenic nutrient inputs enhance microbial respiration within many coastal ecosystems, driving concurrent hypoxia and acidification. During photosynthesis, Symbiodinium spp., the microalgal endosymbionts of cnidarians and other marine phyla, produce O2 and assimilate CO2, and thus potentially mitigate the exposure of the host to these stresses. However, such a role for Symbiodinium remains untested for non-calcifying cnidarians. We therefore contrasted the fitness of symbiotic and aposymbiotic polyps of a model host jellyfish (Cassiopea sp.) under reduced O2 (~2.09mgL−1) and pH (~pH 7.63) scenarios in a full factorial experiment. Host fitness was characterised as asexual reproduction and their ability to regulate internal pH and Symbiodinium performance characterised by maximum photochemical efficiency, chla content, and cell density. Acidification alone resulted in 58% more asexual reproduction of symbiotic polyps than aposymbiotic polyps (and enhanced Symbiodinium cell density) suggesting Cassiopea sp. fitness was enhanced by CO2-stimulated Symbiodinium photosynthetic activity. Indeed, greater CO2 drawdown (elevated pH) was observed within host tissues of symbiotic polyps under acidification regardless of O2 conditions. Hypoxia alone produced 22% fewer polyps than ambient conditions regardless of acidification and symbiont status, suggesting Symbiodinium photosynthetic activity did not mitigate its effects. Combined hypoxia and acidification, however, produced similar numbers of symbiotic polyps compared with aposymbiotic kept under ambient conditions, demonstrating that the presence of Symbiodinium was key for mitigating the combined effects of hypoxia and acidification on asexual reproduction. We hypothesise that this mitigation occurred because of reduced photorespiration under elevated CO2 conditions where increased net O2 production ameliorates oxygen debt. We show that Symbiodinium play an important role in facilitating enhanced fitness of Cassiopea sp. polyps, and perhaps also other non-calcifying cnidarian hosts, to the ubiquitous effects of ocean acidification. Importantly we highlight that symbiotic, non-calcifying cnidarians may be particularly advantaged in productive coastal waters that are subject to simultaneous hypoxia and acidification.